2013-04-18 – The Molenbeek Cultural and Social Cohesion Centre (MCCS) is currently engaged in extending the line of wind turbines by the side of the Canal in the Anderlecht direction. The work should be complete by the end of April. 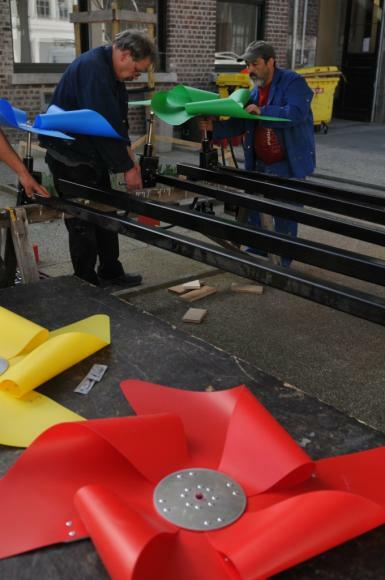 The installation of multicoloured wind turbines is one of the MCCS’s many initiatives aimed at adding colour to this district and improving the Canal area’s image. In 2005, as part of the Fonderie-Pierron District Contract, the MCCS built and installed 35 wind turbines on Quai des Charbonnages, on the Canal’s central stretch, in partnership with pupils and teachers from the Athénée royal Serge Creuz secondary school. The project involved the creation of 35 turbines with a span of 1.5 metres, installed along the Canal’s left bank on 4-metre metal poles. The idea originated from the etymological origin of the Flemish name of the municipality of Molenbeek: molen = mill and beek = river. In 2007, a further 35 wind turbines were installed on Quai des Charbonnages. 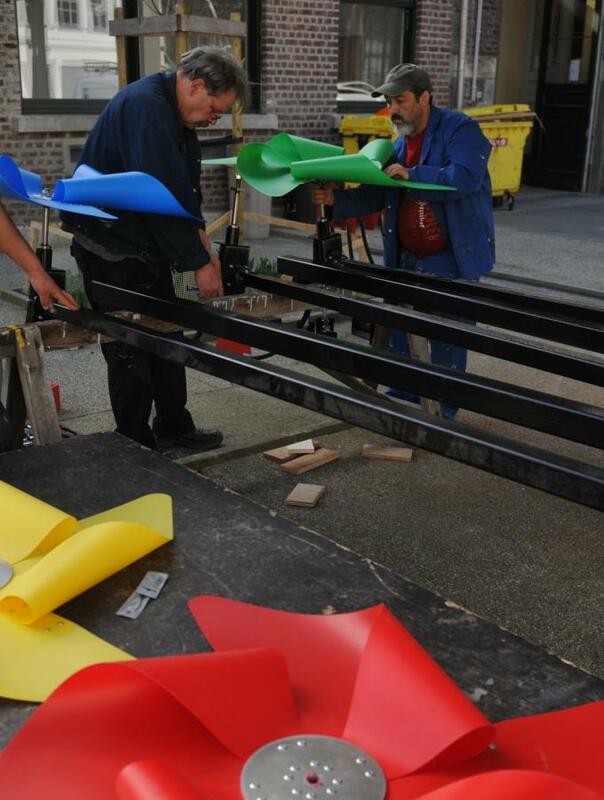 The extension of the original installation in the public space has been initiated as part of the Cinéma-Bellevue District Contract: 60 new wind turbines are gradually being set up by the MCCS technical team by the side of the Canal, on both sides of the water, on Quai de Mariemont and Quai de l’Industrie, between Molenbeek Lock (Porte de Ninove) and Delacroix Bridge at the edge of the municipality. 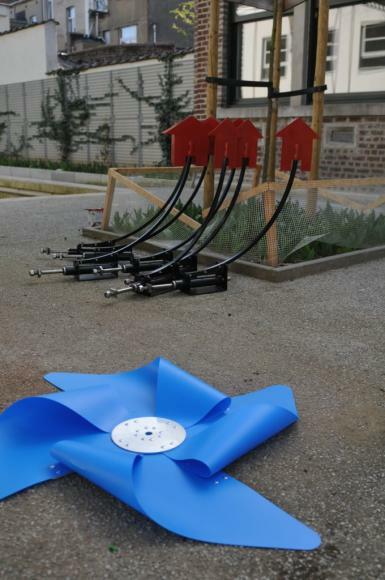 Over time, this array of multi-coloured turbines has, in the media in particular, come to symbolise the municipality of Molenbeek, its social dynamism and its regeneration. So much so that the double-decker tourist buses take delight in driving from one end of the line to the other! 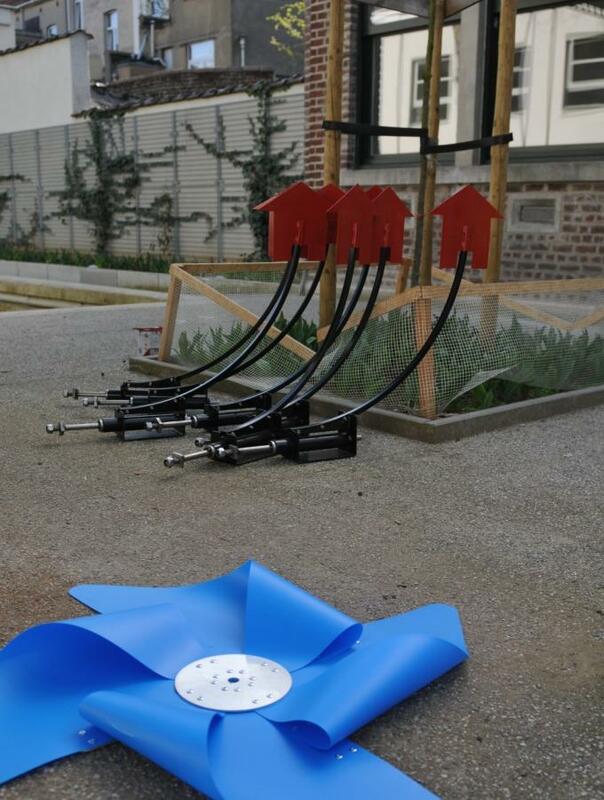 Furthermore, the wind turbine has been chosen as the symbol of civic energy for the logo of the “Molenbeek Cultural Capital 2014” campaign.